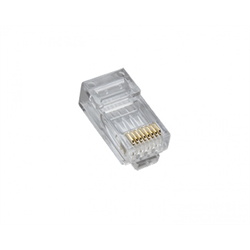 These RJ45 CAT5e connectors are designed to provide superior performance. The simple one piece deisgn and hi-lo stagger create an easy to terminate, high quality connection. Gold plated contacts. Use with a crimp tool like the Tele-Titan.